First shown at the 1955 Geneva Motor Show, this one-off Jaguar was crafted by Pinin Farina for American luxury car importer Max Hoffman. 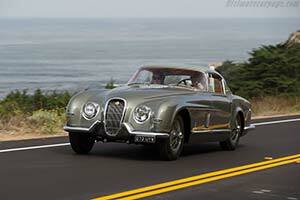 It was based on the latest, high performance XK120 SE and while boasting a distinct design, Pinin Farina based their work on the original Jaguar panels. What happened next to the only XK120 bodied by Pinin Farina is not known but it eventually re-surfaced when it was acquired in the United States by a German, who brought the car to Germany. He had intended to restore the car but never got around it. Almost 40 years later, it was bought by a British enthusiast, who had specialists Classic Motor Cars (CMC) carry out the long overdue restoration. With very little period information, it was difficult to determine the original colours but fortunately some of the first paint was found underneath bumpers and window trim. Some of the parts, like the taillights, had to be remade using the latest technologies like 3D printing. After 6,725 man hours, the work was completed, and the one-off Jaguar made its post-restoration debut at the 2017 Pebble Beach Concours d'Elegance where it placed second in class.